I mentioned the last time I posted here that I might be through with solving murders. Now, that appears to be more of a reality. Maybe. The last book chronicling my figuring out whodunit was TEACUP TURBULENCE, which was published last January. 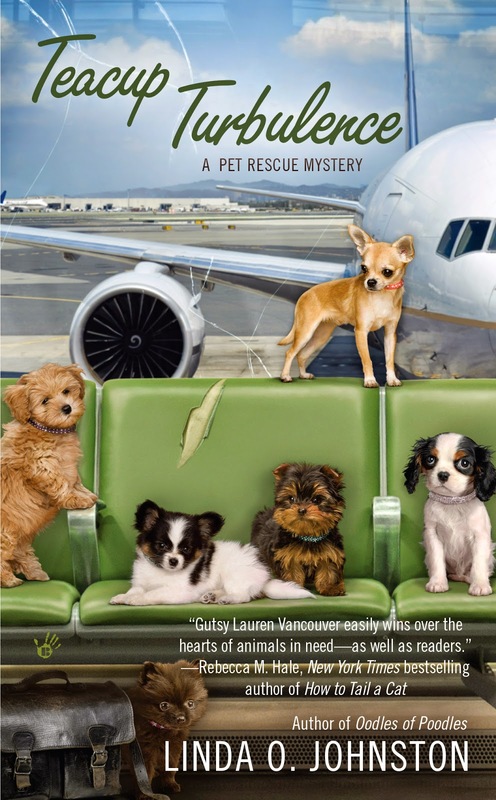 I did find myself in the position of finding another killer in the e-novella CHIHUAHUA CHAOS, which I understand is available on Amazon for Kindle. Since then, I've been able to concentrate solely on rescuing animals at HotRescues, my wonderful shelter in L.A.'s San Fernando Valley. I hope that continues--although I do admit it may be a bit too calm around here when I'm not running around trying to help my friends and acquaintances figure out who is framing them for murder. But that's certainly a good thing for the animals I'm helping. Will I ever solve another mystery again? I don't know, but the chronicler of my adventures, Linda O. Johnston, tells me never to say never. She's still busy--Linda, I mean. She tells me she's now chronicling the adventures of a couple of other people who never set out to solve murders but found themselves in that position anyway. 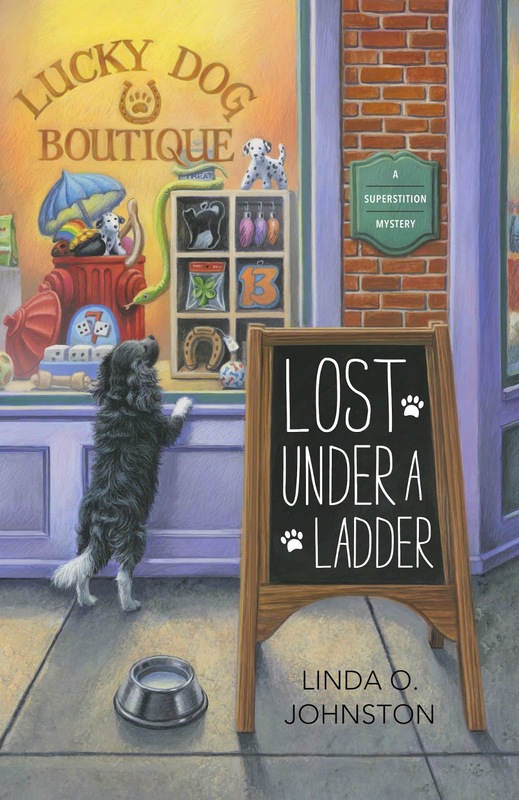 The adventures of one of those people, Rory Chasen, will be memorialized in the Superstition Mysteries, starting in October with LOST UNDER A LADDER. And there's another person whose stories will start next year. Both sets of stories will be published by Midnight Ink. I understand that Rory spoke with you here on Killer Characters last month, and I'm sure she'll be back. Her adventures sound interesting. Like me, she's an animal lover, and in addition to trying to understand superstitions she will also be managing a pet boutique. And, yes, I know she solves a murder in LOST UNDER A LADDER. Since Rory's into superstitions, I suspect it might be bad luck for me to keep trying to post here when her stories begin, but I'd check with her first, just in case. The other person? I don't know a lot about her yet, but I believe one of her vocations is to own a barkery where she bakes treats for dogs. She, too, trips over dead people. Meantime, I promise to stay in touch with Linda, and if I happen upon another murder in my life I'll let her be the one to write about it. Please feel free to tell her if you'd like to hear more about me in the future. For now, have fun, be good to animals, and stay away from murder victims if you can. I hope you get to share more of your adventures! I've loved them all. Not that I hope for murders, but I so enjoy you and your friends. Guess "all good things come to an end", but to lose a means of promoting pet rescue is sad! Thanks, lkleback. As I said, one never knows what's going to happen in the future. Maybe I'll be back. Patricia T, Linda tells me she'll continue to promote pet rescue when she can. She agrees that it's a very worthwhile thing to do. A barkery - let us know when it opens and Pep and I will be there! Thanks, Grandma Cootie. I'll tell Linda to let you know. I might even visit it! Thank you, Nancy. I appreciate hearing that. I'll miss you, Lauren. And, sadly, I'll have to miss Chihuahua Chaos, since I don't read e-books. But Rory sounds interesting, and so does the mysterious other person with the barkery! Sorry that you won't get to read my last adventure, Carol B. But I hope you enjoy the upcoming stories even though I won't be in them. And thank you for commenting, Lorraine. As I said to Carol B, I hope you enjoy the new stories even though I won't be in them. Who knows? I might even read them myself. Will miss Lauren but excited to meet Rory and the new person. Thanks, Dru. I will miss my readers, too. I hope you enjoy the new books.